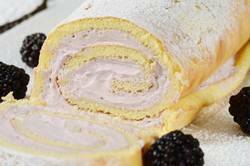 When a Sponge Cake is baked in a sheet pan and then rolled around a filling, it is called a Jelly Roll (for the Americans), a Roulade (for the French), and a Swiss Roll (for the English). A Sponge Cake presented in this way has a beautiful pinwheel design, and while I have filled the cake with raspberry flavored whipped cream, you can also fill it with plain whipped cream, lemon curd, chocolate ganache, or even just a layer of jam. The only garnish this sponge cake needs is a dusting of confectioners (powdered or icing) sugar. When I decided to review Rose Levy Beranbaum's 'Cake Bible', this is one of the recipes I decided to make. This cake is wonderfully light and airy and it contains just three basic ingredients: eggs, sugar, and flour. It's leavened solely by the air beaten into the eggs. Normally, sponge cakes are made with just flour, but this recipe calls for replacing some of the cake flour with cornstarch (corn flour) to make the cake's crumb even more tender. However, I have often made this cake using all cake flour (total 1/2 cup (65 grams) and have hardly noticed the difference. Now, beating the egg yolks and egg whites separately produces an elastic sponge cake that allows the cake to be rolled without cracking. The recipe calls for separating only two of the eggs, not all four eggs. One thing I would like to try is separating all four eggs to see what difference that would make to the finished cake. Cracking of the Sponge Cake is also prevented by rolling the sponge in a clean towel immediately after it is removed from the oven. Once the sponge cake has cooled to room temperature it is then filled with raspberry flavored whipped cream. This cream is made by simply whipping heavy cream (double cream) (cream with a 35-40% butterfat content) with a little vanilla extract and sugar and then adding either raspberry jam (preserves) or a raspberry sauce (puree). Other flavors of jam could also be used in place of the raspberry jam. Well wrapped, the Sponge Cake can be stored in the refrigerator for several days. For Sponge Cake: Preheat oven to 450 degrees F (230 degrees C) and place oven rack in the center of the oven. Butter, or spray with a nonstick vegetable spray, a 17x12 inch (43x30 cm) baking pan, line it with parchment paper, and then butter and flour the paper (or spray with a nonstick vegetable/flour spray). While the eggs are still cold separate two of the eggs, placing the yolks in one bowl and the whites in another bowl. To the yolks, add the additional yolk, and the two remaining eggs. Cover bowls with plastic wrap and allow the eggs to come to room temperature (about 30 minutes). Meanwhile, in a small bowl whisk the flour with the cornstarch. Place the egg yolks and whole eggs, along with 1/2 cup (100 grams) of the sugar, in your electric mixer, fitted with the paddle attachment. Beat on high speed for five minutes, or until thick, pale yellow, and fluffy. (When you slowly raise the beaters the batter will fall back into the bowl in slow ribbons.) Then beat in the vanilla extract. Sift half the flour mixture over the beaten egg mixture and fold in gently with a rubber spatula, just until the flour is incorporated. Sift the remaining flour mixture into the batter and fold in. In a clean bowl, with the whisk attachment, beat the egg whites until foamy. Add the cream of tartar and continue beating until soft peaks form. Sprinkle in the remaining one tablespoon sugar and beat until stiff peaks form. Gently fold a little of the whites into the batter to lighten it, and then add the rest of the whites. Pour the batter into prepared pan, spreading evenly with an offset spatula or spoon. Bake for about 6-8 minutes or until golden brown and when lightly pressed, springs back. Immediately upon removing the cake from the oven sprinkle with confectioners sugar and then invert the cake onto a clean dish towel. Remove the parchment paper, sprinkle with confectioners sugar, and roll up the sponge, with the towel. Place on a wire rack to cool. For Raspberry Whipped Cream: Place your mixing bowl and whisk attachment in the freezer for 15 minutes. Then place the whipping cream, vanilla extract, and sugar into the bowl and beat until soft peaks form. Add the jam and beat just until stiff peaks form. To Assemble: Unroll the sponge, spread with the cream and reroll. Cover and chill in the refrigerator for a few hours. Just before serving, dust with confectioners sugar.